Innovator Brad Kriel is bringing high-tech gadgetry to a hands-on industry. His new tools can benefit both modular home factories and builders. The 37 year old is founder and CEO of Velocity Robotics, a North Side-based startup company that makes “smart tools” to eliminate human error in construction and fill gaps in the skilled labor shortage. Last week, his innovations earned Kriel’s company first place in AlphaLab Gear’s Hardware Cup competition at Google’s offices at Bakery Square. 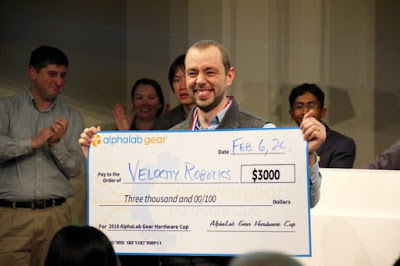 Velocity came up short in the contest two years ago, but wowed the AlphaLab judges this year with their productivity aids. Among Velocity Robotics’ smart tool creations: AutoSet, a miter saw attachment, that uses Bluetooth tech to record accurate measurements in a smartphone app and sends those exact measurements to a saw to help make precise cuts. That accuracy can allow construction to move faster and prevents the cost and waste that come from materials being cut imperfectly, solving two major pain points for contractors. With $3,000 in prize money in his pocket, Kriel will move on to the international finals. If he wins at that competition here in Pittsburgh in April, victory comes with a $50,000 convertible-debt investment from Startbot VC. The second and third prize winners in the international finals will also receive cash prizes. His website states he is looking for investors to help him launch his app-based tool line. Just might be something for some of you to look at.